Average asking prices were either stagnant or falling in November, according to two of Spain’s biggest property-portals. House prices (asking) fell by an annualised 2.1% according to the property portal Idealista.com, but were almost unchanged, rising by just 0.3%, according to the portal Fotocasa.com. They are highlighted in yellow in the SPI House Price Index Tracker chart above. 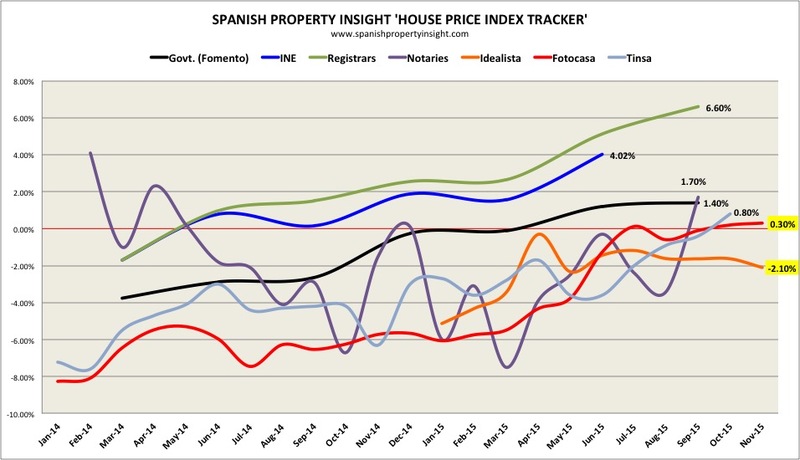 The SPI House Price Index Tracker brings together seven of the leading sources of house price data in spain, including asking prices (Fotocasa & Idealista), sales prices (registrars & notaries), and valuations (Fomento & Tinsa). Using the SPI House Price Index Tracker we can see that asking prices are heading in a different direction to the other indices. After rising from declines of around 6% at the start of the year, asking prices appear to have lost their upward momentum, whilst all the other indices appear to be still heading upwards. It may be that asking prices are leading indicators, as they are available sooner than the others, which will follow suit when their results for November are published. Or it could be that asking prices do a better job of reflecting the change in value of the overall stock of property for sale, rather than just the properties that get sold. There are a lot of unattractive properties on the market, whose owners have no option but to drop their prices in search of a buyer, and that is captured by asking prices. In fact there are three types of property for sale in Spain: 1) Homes that are priced to sell and will find a buyer, 2) Homes that will sell when the price is right, and 3) Homes that will never sell because they have no demand at any price. Ratings agency Fitch recently estimated there are 150,000 new homes in Spain that will never sell. Having pounded the pavements this week and viewed a selection of flats in central Valencia city, from turn-key ‘entrar y vivir’ to total projects, it looks to me that Mark’s Category 1 is well to the fore here, with many a Cat 2b ‘priced just over present selling prices but soon to go cat 1’ following on. My offer at 14% off was rejected with ‘asking price firm’. Another offer at 6% off got the same response. Maybe the fact that one of the two sellers is based in N.Y.C. had something to do with this. I was told that the asking had recently been reduced but they would say that, wouldn’t they? It might even be true. An offer on the asking price got the thing done.